HomePoliticsSteven Seagal Appointed by Russia as Special Envoy to the U.S.
August 5, 2018 Paul Politics Comments Off on Steven Seagal Appointed by Russia as Special Envoy to the U.S. The position is unpaid, said Russian officials, who compared the role to that of a United Nations good-will ambassador — a distinguished volunteer who calls attention to the work of the United Nations. Relations between the two countries have been fraught as United States intelligence agencies have accused Russia of interfering in the 2016 elections and have warned it could do so again in the November contests. The countries have also been at odds over the Syrian civil war and the Russian annexation of Crimea. Mr. Seagal, who occasionally appears on Russian state television, said he welcomed the appointment, Reuters reported. Mr. Seagal, 66, could not immediately be reached for comment on Sunday. Mr. Seagal’s films, which often highlight his martial arts skills, are popular in Europe. In his first big role in the 1988 movie, “Above the Law,” Mr. Seagal played a former C.I.A. agent and in one of his latest films, “Mercenary: Absolution,” he played a contract killer. He called Mr. Putin a personal friend and expressed a desire to improve relations between the United States and Russia. Mr. Seagal’s grandparents were Russian Jewish immigrants, according to a biography on IMDB. In November 2016, the Kremlin announced that Mr. Seagal had received Russian citizenship. 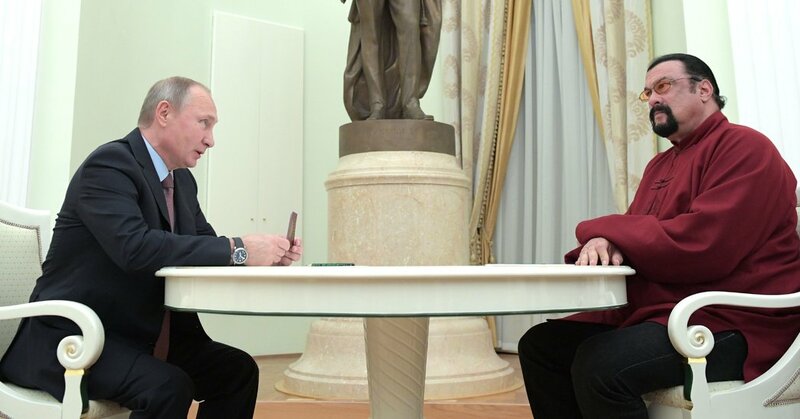 Later that month, Mr. Putin, who has been described as a fan of the martial arts that Mr. Seagal practices in his movies, personally presented the actor with a Russian passport. A Kremlin spokesman cited Mr. Seagal’s “warm feelings toward Russia” and his celebrity status as reasons for the gesture, according to Reuters.